Most managers agree that one of the most difficult tasks they face is firing an employee. A tiered model in athletics does create an economic class system. Policies should clearly define the responsibilities of staff members and higher administration officials (registrar, director of admissions, and so on) in the determination of eligibility, the submission of supporting data, and the completion and submission of required compliance reports. Athletic events present myriad revenue generation possibilities including event ticket sales (season, individual game, and special or postseason events), concessions, guarantees, and parking. 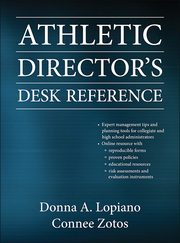 Athletic Director’s Desk Reference is the most authoritative and comprehensive resource available for collegiate athletic administrators. This book and web resource guide program administrators in navigating their increasingly complex roles in athletic programs of any size. Athletic Director's Desk Reference With Web Resource is the most authoritative and comprehensive resource available for collegiate athletic administrators. Loaded with practical tools, this resource guides program administrators in navigating their increasingly complex roles in athletic programs of any size. With this reference, administrators will confidently handle typical and unexpected situations and address the various policy and system needs required for running a successful athletic program. Authors Lopiano and Zotos, well known and respected for their contributions to collegiate and scholastic athletics, guide readers with more than 75 combined years of experience as athletic program administrators, coaches, and consultants. Complete with a practical web resource, Athletic Director's Desk Reference offers extensive advice and tools for today's athletic director, covering leadership and organizational planning, office and facilities operations, staff management, student–athlete relations, team administration, event management, fundraising, media relations, and more. Both the print and e-book versions of Athletic Director's Desk Reference help readers quickly find the materials and information required for performing specific tasks or functions. They include numbered contents and cross-references to the web resource, allowing readers to move seamlessly between the two. Management tips in the book present foundational information, problem-solving strategies, and suggestions for management of employees, programs, events, and facilities. Planning tools in the book provide specific steps or considerations to take in the development of strategic plans, action plans, professional development plans, and governance systems. Educational resources in the web resource can be used for teaching and motivating staff members, campus constituents, volunteers, and student-athletes. Evaluation instruments and risk assessments in the web resource help directors, supervisors, and employees assess job performance, evaluate program contents, identify risks, and prevent litigation. A special evaluation instrument in Chapter 10 contains 27 spreadsheets to help athletic directors collect and analyze data necessary to determine Title IX compliance. Policies and forms in the web resource allow athletic directors to produce effective policies and procedures with only simple modifications and customizations. The engaging narrative, philosophies, and advice from seasoned professionals combined with customizable and practical materials make this a unique and essential reference for athletic directors of all levels and abilities. Athletic Director's Desk Reference empowers administrators to confront issues and lead with confidence while saving time and research. As a result, athletic directors will become more efficient, more effective, more mission driven, and more successful in virtually any task, decision, or strategy. A primary reference for intercollegiate athletic program administrators. Also a resource for administrators of high school athletic programs, courses in athletic administration, and libraries. Donna A. Lopiano, PhD, is president of Sports Management Resources, a consulting firm that draws on the knowledge of experienced former athletic directors to assist scholastic and collegiate athletic departments in solving challenges in growth and development. She served for 18 years as the director of women’s athletics at the University of Texas at Austin and is a past president of the Association for Intercollegiate Athletics for Women. During her tenure at Texas, she built what many believe to be the premier women’s athletic program in the country, twice earning the award for top program in the nation. Lopiano was the chief executive officer of the Women’s Sports Foundation from 1992 to 2007 and was named one of the 10 most powerful women in sports by Fox Sports. The Institute for International Sport also named Lopiano among the 100 most influential sport educators in America. She has been recognized for her leadership as an athletic administrator and for advocating for gender equity in sports by the International Olympic Committee, National Collegiate Athletic Association, National Association for Girls and Women in Sport, National Association of Collegiate Women Athletics Administrators, and National Association of Collegiate Directors of Athletics. She has been a coach of collegiate men’s and women’s volleyball and women’s basketball and softball and has coached the Italian national women’s softball team. As an athlete, she participated in 26 national championships in four sports and was a nine-time All-American in four positions in softball, a sport in which she played on six national championship teams. She is a member of the National Sports Hall of Fame, National Softball Hall of Fame, and Connecticut and Texas Women’s Halls of Fame, among others. Lopiano resides in Easton, Conneticut. Connee Zotos, PhD, is a clinical associate professor of sports management in the Tisch Center for Hospitality, Tourism, and Sports Management at New York University in New York City. She is also a senior associate for the consulting firm Sports Management Resources. Zotos has over 38 years of experience in scholastic and collegiate athletics as a basketball and field hockey coach, Division II and Division III athletic administrator, and professor. Zotos served as the director of athletics at Drew University in Madison, New Jersey; director of athletics, recreation, and wellness at William Smith College in Geneva, New York; and director of women's athletics at Philadelphia College of Textiles and Science in Pennsylvania. She has published numerous articles in refereed and nonrefereed journals and is a noted speaker and author on tiered funding models in collegiate athletics, coaches’ employment and compensation packages, coach evaluation systems, and gender equity in sport. Zotos has served on the NCAA Division III Management Council and is a past president of the Collegiate Athletic Administrators of New Jersey. She was also a member of the board of directors for the National Association of Collegiate Women Athletics Administrators and the Honda Collegiate Women Sports Award. In 2004 she received the award for Division III Administrator of the Year from the National Association of Collegiate Women Athletics Administrators. For her contributions to the development of collegiate athletics, Zotos received the 2011 Garden State Award frrom the Collegiate Athletic Administrators of New Jersey. She also received a Teaching Excellence Award from the School of Continuing and Professional Studies of New York University in 2011. Zotos resides in Clifton, New Jersey.